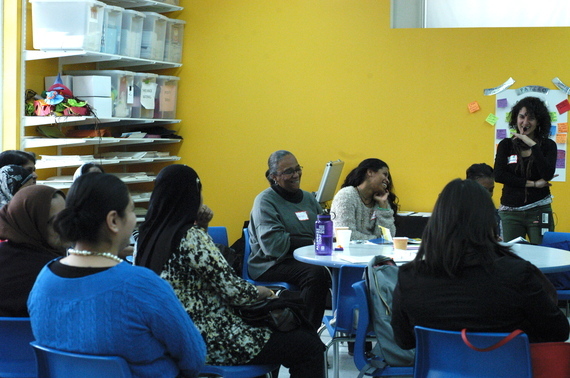 On March 1, members of community-based organizations across New York City came together at El Museo del Barrio in East Harlem for a day of discussion and building connections rooted in a commitment to community being at the center of their work and a belief in the importance of those most impacted by injustices being in the forefront of the organizing that emerges. Facilitated by the Participatory Action Research Center for Education Organizing (PARCEO), the day offered an opportunity to share experiences and knowledge, learn from one another, address challenges and envision together. The day grew out of months of preparation and planning and interaction amongst the groups, all of which have been partnering or collaborating with PARCEO over the past year. Roundtables emerged based on what groups wanted to share with one another and issues they wanted to explore together. The day was designed not as a conference of people "presenting" information, but, rather, as a collaborative, interactive opportunity to generate shared knowledge and ways of moving forward together. One of the most important goals -- and outcomes -- of the day was an opportunity for groups that often feel isolated to connect and begin to build relationships with one another. Parents, educators and youth activists came from many different communities across New York City -- and interpretation was provided throughout the day in Spanish and Bengali. As the PARCEO team wrote in a follow-up letter to the participants, "It was a day of inspiring one another and building solidarity across our diverse communities and areas of work... Through roundtables and informal discussions, we realized our many commonalities and shared challenges and the ways we can support and encourage each other's work though we come from distinct backgrounds." El Museo del Barrio offered a warm, welcoming space consistent with the spirit of the day. Working with social justice oriented childcare and interpretation collectives and community food cooperatives contributed to an inclusive and participatory event that celebrated the strengths of the many communities that were there. PARCEO (which I am part of) remains committed to offering a space for work rooted in PAR -- that is, work that recognizes, values and builds upon community members' knowledge, wisdom, and expertise -- to flourish. Through trainings, workshops, resource development and one-on-one support, PARCEO works with groups engaged in organizing for justice and in building genuine community. The video below offers a sense of the power of the groups and the day.